14kt Gold & Diamond Ancient Biblical Widow's Mite Pendant circa 103-76 B.C. Authentic Ancient Biblical "Widows Mite" Bronze Coin Mounted in 14kt Solid Gold Diamond .. Authentic Ancient Roman Silver Coin Mounted in 14kt Solid Gold & Sterling Silver Pendant ..
ATOCHA 2 REALES Mounted in a beautiful solid 14kt yellow gold dolphin pendant..
ATOCHA 2 REALES GRADE II Mounted in a beautiful solid 14kt yellow gold seahorse pendant. .. 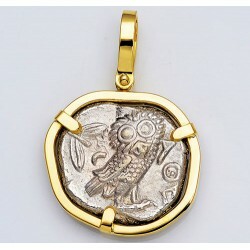 Authentic Ancient Roman Silver Coin Mounted in 14kt Solid Gold Gemstone Pendant .. Authentic Ancient Roman Silver Coin Mounted in 14kt Solid Gold & Pink Tou..